Thanks very much for joining BBC Scotland's coverage today. My colleague Colin Moffat will be bashing out the match action, info, analysis, gags, tweets, images and whatnot tomorrow in the live text commentary for the Dundee derby. Have a great evening. "We had four fantastic chances before Inverness had any of their own. Going in at 2-0 down you know the next goal is crucial. It's a horrible mistake by the referee missing Miles Storey's handball to control the ball, but what a strike. We didn't take our chances and Inverness did. Credit to them; after the third goal they bossed it. It's a real sore one to take today but if we win our last two games we finish in the top six." "I thought we scored some good goals. We got stronger as the game went on. We knew what Ross County had been through, mentally and physically. They couldn't switch the engine on. They had to play on Wednesday night. I felt we deserved it today. A wee bit of luck went our way today. I've seen us play better, and on a tricky pitch." Raith Rovers are hosting Hibs in the Championship. It's goalless after eight minutes. "There was too much hesitancy for the first (Motherwell) goal. Motherwell put you under pressure. The second goal, we deserved to be punished. We made it easy for Moult to lift it over. It was a red card (for Robson), he should know better. The referee is right to send him off. I still think there will be twists and turns. It's our second defeat in 18. We made a couple of errors and we've been punished. There are still 21 points to play for. You finish where you deserve to finish. We have work to do. It was two poor goals from our point of view and then Barry going off makes it more of a challenge. I didn't think there was room for error before today. There is still plenty to play for." Would Robson even need to take a shower? Referee Don Robertson sends off Aberdeen midfielder Barry Robson for striking Scott McDonald with his forearm. Robson had just come on as a sub.Image caption: Referee Don Robertson sends off Aberdeen midfielder Barry Robson for striking Scott McDonald with his forearm. Robson had just come on as a sub. Happy Saintee Derick: "Can someone please ask Derek McInnes where that 'bottle' he claimed his side had went to today?" "We had no complaints, of course it was a penalty. I thought our shape was better. Getting Louis Moult and Scott McDonald up against their centre halves worked for us. Two good goals, I can't complain. I think if we can win another game we can think about the top six. We'll be ready for the Inverness game. We will stand by James and nurse him back to fitness." Danny in Glasgow: "Disgraceful decision, never a penalty, no wonder McGhee's fuming, anything to help Aberdeen win, shocking!" John MacLean, Cheers Bar: "Expected better from Robson. Question McInnes's team selection today. Should never have let Langfield go as he very rarely let us down." 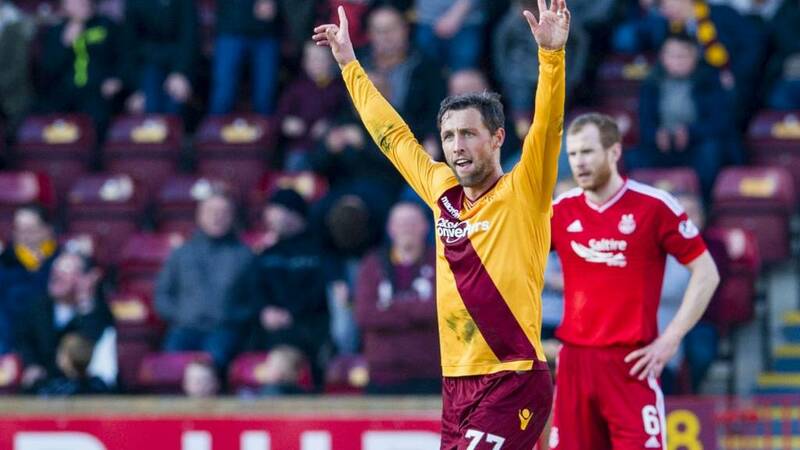 Motherwell win their fifth league game out of six as they severely dent Aberdeen's title hopes. Ryan Edwards' first ever goal for Partick Thistle clinches all three points for Alan Archibald's side. Motherwell carve Aberdeen open with some slick passing and substitute Wes Fletcher must wrap up the victory but no, the substitute fluffs a shot straight at Scott Brown from six yards. A wonderful third for St Johnstone, as Darnell Fisher puts the icing on the cake. They counterattack with Hearts stretched at the back, and after lovely interplay between Stevie McLean and David Wotherspoon, the right-back guides the ball beyond Neil Alexander. Superb. Iain Russell scores the sixth goal of the game for the Dumfries men. Denny Johnstone adds to the Ton's tally. The comeback is complete for Thistle as Ryan Edwards heads them in front from Kris Doolan's cross. Declan McManus surely makes the points safe for Jim Duffy's men at Cappielow.